Non seulement nous ne sommes pas toujours en train d'utiliser notre odorat, explique Alexandra Horowitz, mais lorsque nous l'utilisons, c'est souvent parce qu'on sent une bonne ou une mauvaise odeur: il s'agit rarement d'une simple source d'information. Les odeurs que nous percevons la plupart du temps sont soit agréables soit répugnantes, très peu ont un caractère aussi neutre que notre vision... de même que nous voyons le monde, le chien le sent. Il y a deux conduits aériens dans la truffe (entre 2.000 et 3.000 millions de capteurs, contre 6 millions chez l'homme) : l'un pour respirer, l'autre pour sentir le monde environnant, percevoir les mouvements, ou encore faire la différence entre amitié et hostilité. Plus impressionnant encore, le nez du chien l'aide à voir des choses qui ne sont plus ou pas encore visibles: il détecte ce qui a eu lieu plus tôt (la voiture garée à un emplacement quelques minutes plus tôt) et ce qui n'est pas encore arrivé (une personne qui tourne au coin de la rue). Nous sommes peut-être capables de remarquer que quelqu'un a ajouté une cuillère de sucre à notre café, mais le chien peut détecter cette cuillère de sucre dans l'équivalent de deux piscines olympiques. Mais l'être humain aussi a du flair ! Très instructif "De la molécule à l'odeur". Human scent can be collected by either contact or non-contact sampling mode. The most frequently used human scent evidence collection device known as the Scent Transfer Unit (STU-100) is a dynamic sampling device and is often used in a non-contact mode. 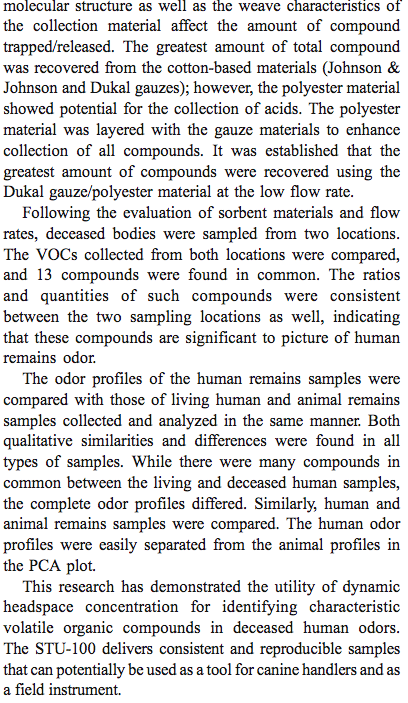 A customized human scent collection chamber was utilized in combination with controlled odor mimic permeation systems containing five standard human scent volatiles to optimize the flow rate, collection material and geometry of the absorbent material. 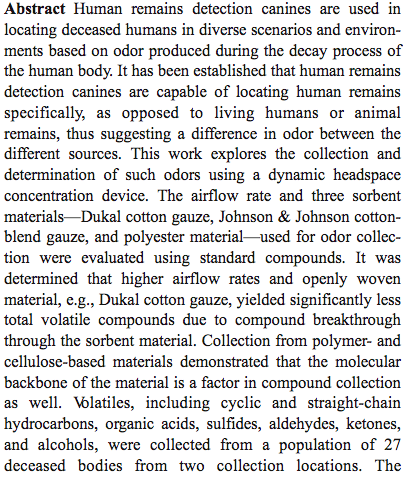 The scent collection method which yielded the greatest amount of volatile organic compounds (VOCs) detected included the use of a single layer of Johnson and Johnson gauze/multiple layers of Dukal gauze with the STU-100 on the lowest flow rate setting. The correlation of the resulting VOC profiles demonstrate that collection of standard VOCs in controlled conditions yielded reproducible VOC profiles on all materials studied with the exception of polyester. Finally, the method was tested using actual human subjects under optimized set of conditions. Individual scent article allows mantrailers to differentiate an odour trail. Saliva as well as DNA extracted from whole blood are sufficient as a key stimulus. Mantrailing appears as a reliable and useful tool for law enforcement authorities. Specially trained dogs have long been used by law enforcement agencies to help in criminal investigations and in searching for missing persons. Still, it is unclear which components of human scent released into the environment contribute to successful searches of individuals. In this study, saliva and axillary sweat samples were taken from a total of 190 people. Additionally, DNA was extracted from whole blood of seven different people and used as an odour sample as well. Overall 675 tests (trails) were performed during a period of 18 months. The ability to track individuals with the odour samples mentioned above was examined with seven dogs, four of which were specially-trained dogs (mantrailer) from the Saxony Police. Results indicated that specially-trained police dogs can track a person with an average success rate of 82% and correctly identify the absence of an odour track with an average success rate of 97% under various conditions. Private rescue dogs were less successful with an average success rate of 65% and 75% respectively. These data suggest that the potential error rate of a well-trained handler team is low and can be a useful tool for law enforcement personnel. Saliva, as a reference odour source, was found to be particularly suitable for the search. The results of the study suggest that the components contained in axillary sweat, saliva and DNA extracted from whole blood are sufficient, serving as a key stimulus for individualized searches. In this study mantrailer dogs were tested under real police operating conditions. With a scent article from a person, they could follow the individual human scent trail of that person statistically highly significantly. Furthermore, they differentiate highly significantly between the presence and the absence of an odour trace using a scent article containing human scent. The best results were achieved with scent articles using saliva and sweat as an odour source. Additionally, highly significant results were obtained with scent articles from wet DNA samples. These findings may provide valuable information for the practical work of dog handlers for selecting suitable scent articles. The study shows that the success rate was higher depending on training method and operational experience level of the teams and for this reason only well-trained and certificated teams should be used in criminal proceedings. It has been shown that well-trained mantrailing-dogs can be in principle a reliable and useful tool for law enforcement authorities. - J Forensic Sci. 2006 Jul;51(4):780-9, Eckenrode BA, Ramsey SA, Stockham RA, Van Berkel GJ, Asano KG, Wolf DA. The Scent Transfer Unit (STU-100) is a portable vacuum that uses airflow through a sterile gauze pad to capture a volatiles profile over evidentiary items for subsequent canine presentation to assist law enforcement personnel. This device was evaluated to determine its ability to trap and release organic compounds at ambient temperature under controlled laboratory conditions. Gas chromatography-mass spectrometry (GC-MS) analyses using a five-component volatiles mixture in methanol injected directly into a capture pad indicated that compound release could be detected initially and 3 days after the time of collection. Additionally, 15 compounds of a 39-component toxic organic gaseous mixture (10-1000 parts per billion by volume [p.p.b. (v)]) were trapped, released, and detected in the headspace of a volatiles capture pad after being exposed to this mixture using the STU-100 with analysis via GC-MS. Component release efficiencies at ambient temperature varied with the analyte; however, typical values of c. 10% were obtained. Desorption at elevated temperatures of reported human odor/scent chemicals and colognes trapped by the STU-100 pads was measured and indicated that the STU-100 has a significant trapping efficiency at ambient temperature. Multivariate statistical analysis of subsequent mass spectral patterns was also performed. Forensic science can be defined as the application of any form of science, in particular analytical chemistry, where ‘the trace, which, by definition, is a pattern, a signal or material transferred during an event (often unknowingly by the actors of the event)’ is analysed and accepted as a form of scientific evidence into a civil or criminal proceeding [1,2]. It is for this reason that knowledge and technology obtained through a sound scientific method should not only meet good scientific practice, but should also comply with the rules of admissibility that are set forth by the relevant courts of law. Overall, science alone may not have the ability to provide definitive solutions, but it can offer increasingly accurate and objective information generating investigative leads, as well as assisting a judge/jury in determining the truth and allowing for justice to be achieved. It is for this reason that there is a necessity for continued scientific advancement with respect to forensic investigations. For more than a century, fingerprint evidence was recognized as the gold standard in forensic science. It was in 1880 that Henry Faulds of Scotland published his seminal paper proposing the use of fingerprints to identify an individual and, in particular, suggested that the skin-ridge patterns could be used to connect an offender to a crime scene . Simultaneously, another cost-effective, real-time detection tool that was being employed by law enforcement officials, owing to its reliability, versatility and speed, was the use of canines (Canis familiaris) . The use of canines in criminal investigations dates as far back as the use of finger-prints. The English used bloodhounds while searching for Jack the Ripper in 1888 and in 1893 the state Supreme Court of Alabama (US) acknowledged that ‘dogs may be trained to follow the tracks of a human being with considerable certainty and accuracy’ . The courts ruled that the testimony regarding the tracking performance of a canine can be presented to the jury, along with other evidence, as a means to connect the defendant to the crime. Since then, canines have been continuously employed for the detection of humans, drugs, explosives and human remains because of their high selectivity and sensitivity towards locating odours. While the canine’s olfaction system is widely relied upon, the system itself is not completely understood, but it is known that, like humans, canines have receptor cells that can detect a compound(s), and olfactory nerves that carry the signals that are interpreted by the brain, allowing for the identity of the odourant to be determined . Unlike humans, however, the canine olfactory system constitutes a much larger portion of its biology, with 50% of the internal nasal area containing olfactory sensory cells and nearly one-eighth of a canine’s brain being dedicated to olfaction. While the average person has some 5 million olfactory sensory cells, common detection canines, such as German Shepherd dogs, have 220 million olfactory sensory cells, indicating that a canine’s olfactory abilities are at least 44 times greater than that of humans . Moreover, canines have approximately 1300 genes in their olfactory repertoire, which is nearly 20 times more than that of humans, providing them with the ability to be trained on various types of odours with a high degree of sensitivity and discriminating power . Over the years, attempts have been made to develop various forms of technology and instrumentation for on-site detection and screening of VOCs, yet none to date has been capable of replicating the combination of selectivity, sensitivity and field versatility demonstrated by canines, which is why they are currently and widely recognized as the gold standard for the field detection of VOCs . This paper highlights the advancements made in analytical chemistry, specifically focusing on the detection of VOCs released from different forensic specimens, the relevance of these specimens to canines and the increased application of odour as a form of forensic evidence.